AM I A STAND FOR MY OWN HEALTH. MY WHOLE LIFE TO A WHOLE OTHER LEVEL? EXCUSES ARE MERELY WHAT THE BRAIN DOES TO HOLD US RIGHT WHERE WE ARE AND DO NOTHING!! on our butts..hmmm I mean the excuses (you might prefer to call them reasons instead). It is easier than any eating plan out there. Not only that, it is a way of life that produces the most outstanding results practically effort free. All you do it eat raw and living food, one at a time. It isnt expensive. Expensive to me is going to the doctor, being sick in bed, feeling bad, having no energy to do anything, being depressed. I fuel my car, I pay insurance on it and upkeep. I take care of my place and pay utilities and keep it clean and orderly YET I am willing to skimp on fuel for my body and minimally maintain it. My possessions get better care than my body? So on and on it goes.....all this clatter running round in the brain is there to serve you somehow. Serve you (it thinks) by keeping you right where you are. Keeping you in this uncomfort zone but the only one you know. Then we have no need to bust out and do something new and different. Remember, people who really stood apart and did extraordinary things, got extraordinary results and made a huge difference in their own lives and in the lives of others. If not now, when? What is holding you back? 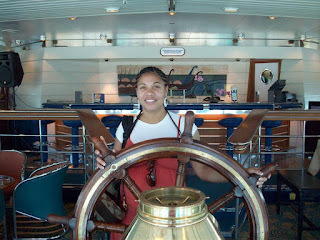 YOU ARE THE CAPTAIN OF YOUR SHIP, AT THE HELM OF YOUR LIFE! Cmon lets get going to a whole NEW LIFE. All the extraordinary things that have happened here!!! !